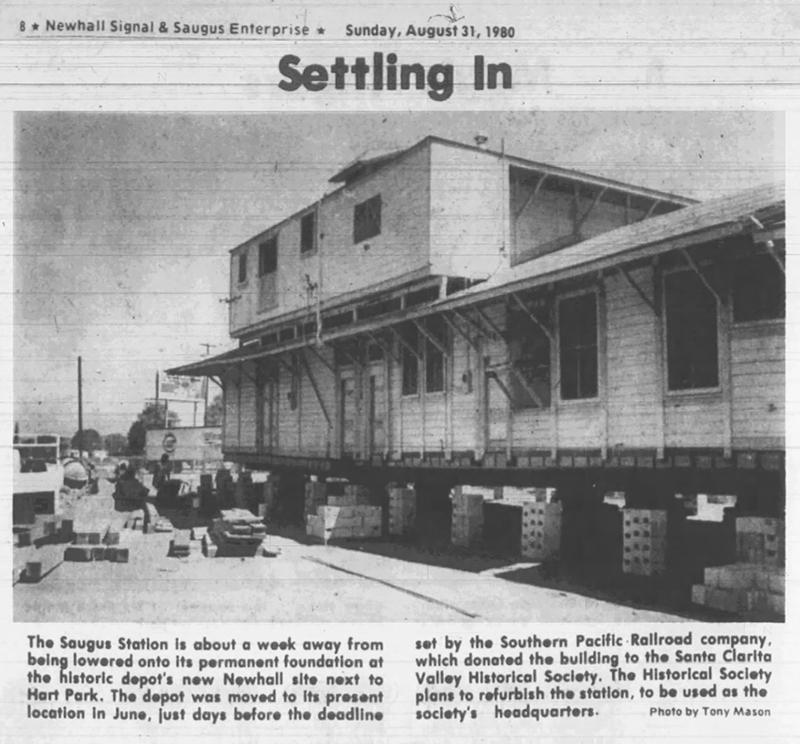 SCVHistory.com HS8001 | Heritage Junction | Photo Gallery: Relocated SPRR Saugus Depot Set on Block Foundation, 9-10-1980. September 10, 1980 — Rescued from the bulldozer by the 4½-year-old Santa Clarita Valley Historical Society, the Southern Pacific Railroad's Saugus depot is set on a block foundation at its new home, Heritage Junction Historic Park, on the "Frew addition" to L.A. County William S. Hart Regional Park in Newhall. 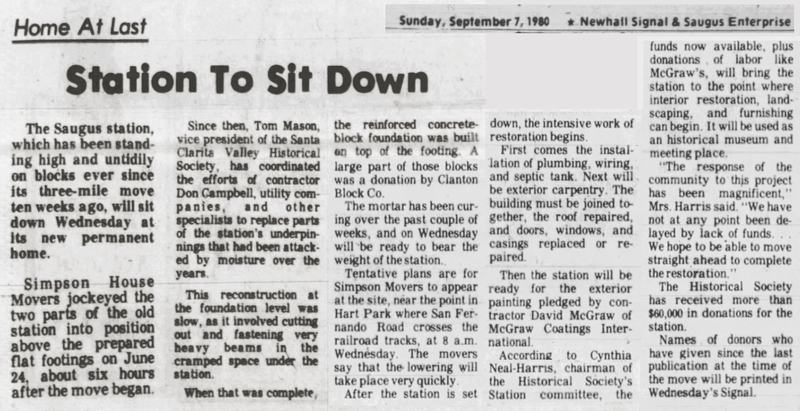 The blocks were donated by Claton Block, a building materials supplier at 25446 San Fernando Road (now Main Street/Railroad Avenue) in downtown Newhall. 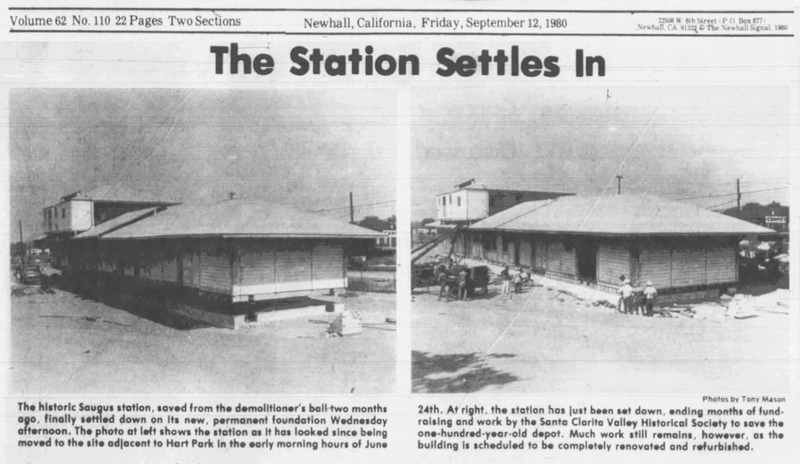 Cynthia Neal-Harris (first photo, second from left) chaired the Historical Society's Saugus Station relocation committee. Photos (35mm color transparencies, Canon F-1 camera) by Tom Mason, the Historical Society's vice president at the time. HS8001: Download original hi-res images here. Color transparencies by Tom Mason courtesy of Cynthia Harris, 2018.